Augustine was a radical convert to Christianity! He was born in Tagaste (modern Souk Ahras, Algeria) in 354 and died in Hippo Regius (modern Annaba) in 431. The Son of so Many Tears! He became a great intellectual, a professor of Rhetoric in the city of Milan. He lived in relative luxury and enjoyed a life of sin. His mother, Monica, was a committed Chrstian and prayed earnestly for his conversion calling him ‘the son of so many tears’. One afternoon as he was sitting in his garden he overheard some children singing ‘Take up and read! Take up and read!’ He became inwardly convinced by the Spirit that he should read the New Testament. He began reading Paul’s letter to the Romans, received powerful revelation of God’s grace in the gospel and was converted. He then became the most zealous exponent of grace of his era, finally settling in Hippo where he became bishop. ‘It has often been remarked that the Biblical doctrine of divine grace, God’s unmerited favour shown to sinful humanity, so clearly (as we might think) expounded in the teaching of Christ and the writings of Paul, seems almost to go underground in the post-apostolic age, to reappear only with Augustine. Augustine is a notable example of many who had nevertheless grasped the truth of God’s grace and sought to preach it consistently. Next time we’ll see how Augustine’s presumption that the age of miracles had ceased was radically changed – by an unexpected act of God’s power. It is amazing to see that there can be many parallels made between the such a long time ago, and today. Even in the 400s, there were converts like Augustine who asked for the same thing as many people today. Augustine’s prayer: “Lord, make me chaste (sexually pure) – but not yet!” is very similar to what many people will do with God today; we want God to give us grace and mercy and change us, but only after we have had what we desire on earth. This parallel was very profound to me, and really showed me how the human sinfulness may have changed shape and form perhaps, but is very close to the same ideas and same reactions as it was in Augustine’s time. Furthermore, the story of God’s intervention or inspiration is one that is perpetuated from back in Augustine’s time to modern day as well. 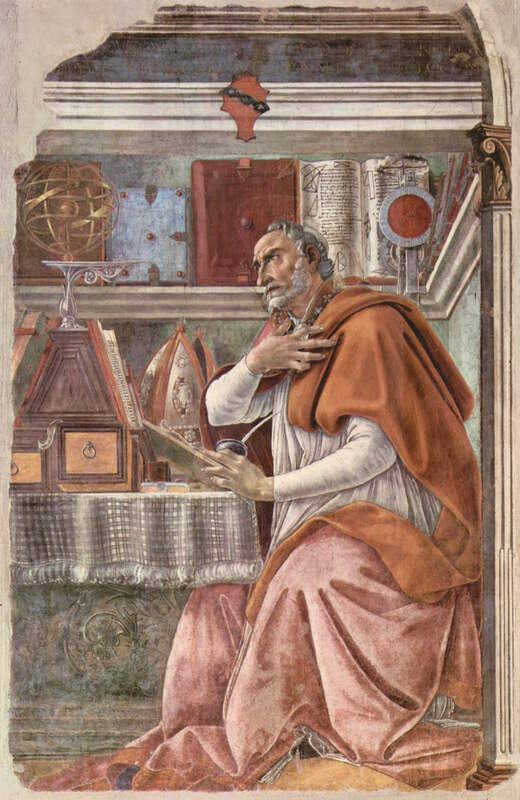 Augustine’s conversion was sudden and came about due to his reading of the book of Romans. He then became an very zealous bishop and led many Christians in their faith journey. The fact that these stories have been continuing for so long shows God’s consistency in changing people’s lives and being and active God who cares for his people and works to save them. Thank you for such an amazing and inspiring post. I find it very interesting that when hearing “Take up and read” Augustine felt compeled to read the New Testament. And from that point, there was an internal spark to read more and philosophically analyze Pauls letters to the Romans etc. And from reading he was able to grasp God’s grace and took it upon himself to preach his beliefs. His initial prayers “…- but not yet” resembles a lot of prayers that are prayed in present day and shows that throughout time, humans feel inclined to get the things they deserve before they ask for God’s grace because they feel that his love and mercy are not as fulfilling as earthly things. Very inspiring quote. Thanks. 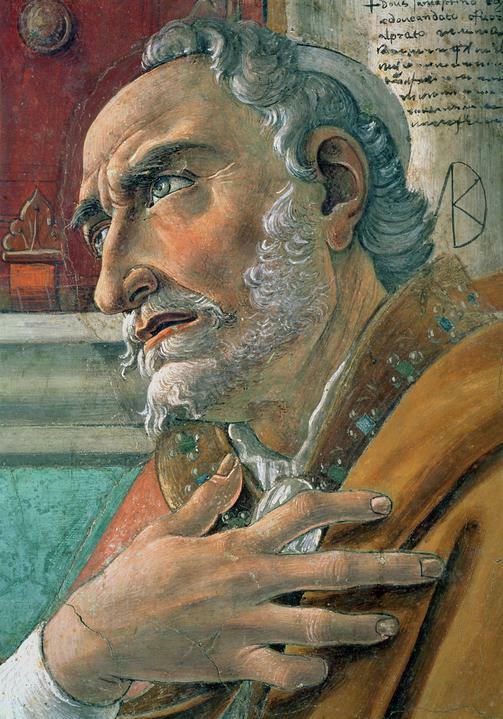 The detail of (one of) Botticelli’s painting(s) of Saint Augustine is actually in reverse. The work is a companion to a work by Domenico Ghirlandaio of St Jerome in his study. The water clock on the shelf indicates the exact time that Jerome died, when Saint Augustine was having a vision of his friend passing into heaven. It is a powerful work. Thanks Greg. I’ll try to find a better high-res image. ALL SAINTS were once a sinner, and ALL SINNERS can become a saint. ..But, from other faiths, I rediscovered that “Do unto others” simply… just… makes… sense. The good ‘ol golden rule makes sense whether I think with my mind, gut, or heart (father, son, spirit?). From that rediscovery I ‘reconfirmed’ that celebrating with others makes sense in the process to help us to’re-remember’… and that same message is ultimately reinforced in most religions folks exist in. Having recognized reuse of “:re-” words, if I could rewind I’d redo unto others better! Thank you, and I hope you and your family had a fantastic Christmas which is only surpassed by the new year to come! !